"New Trends and Technologies in Computer-Aided Learning for Computer-Aided Design" contains the proceedings from the EduTech Workshop, an IFIP TC-10 Working Conference held in Perth, Australia. The workshop aimed to explore the interrelationship between computer-aided technology and computer-aided learning. Computation and communication technologies underpin work and development in many different areas. 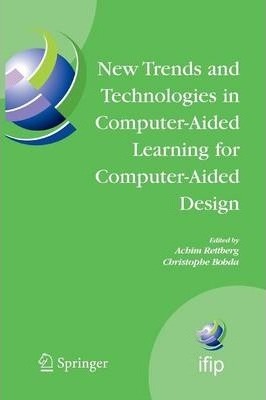 Among them, Computer-Aided Design of electronic systems and E-Learning technologies are two areas which are different but share many concerns. The design of CAD and E-Learning systems already touches on a number of parallels, such as system interoperability, user interfaces, standardization, EML-based formats, reusability aspects (of content or designs), and intellectual property rights. Furthermore, the teaching of Design Automation tools and methods is particularly amenable to a distant or blended learning setting, and implies the interconnection of typical CAD tools, such as simulators or synthesis tools, with e-learning tools.